There is really only one reason to relaunch a series that is already producing good work – increased sales. Comic fans cannot help themselves when it comes to an issue with a #1 on it. Collectibles aside, relaunching a series does give people an opportunity to join the series at a fresh start. Many people may have heard that Mark Waid and Chris Samnee were doing some inventive things with the Daredevil character but maybe they were put off by a series 30 issues into its run. Voila! 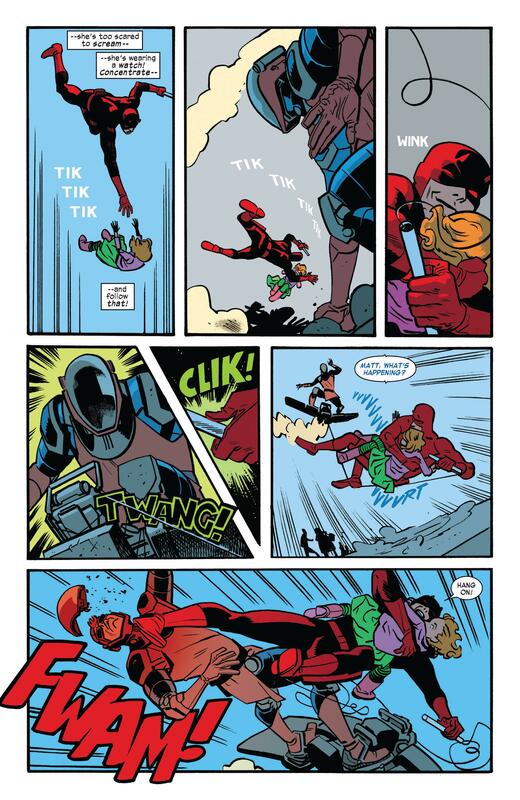 Marvel has relaunched Daredevil as part its shiny “All-New Marvel Now!” promotion, though it’s still written by Waid and drawn by Samnee. Oh, wait, there is a second reason to relaunch: it’s $3.99 now rather than $2.99 (though that’s basically the same reason as increased sales). The risk that Marvel ran with relaunching Daredevil was that Waid and Samnee were on a good run, so forcing a change could interrupt their groove. Well, thankfully, Waid was able to hold off the relaunch until the right time in the story, and he’s moved the story to a natural “change” point. Daredevil, now fully outed as Matt Murdock, must leave his home in New York City in order practice law. He chooses San Francisco, where he once lived (during a period in the 1970’s run of the comic). So this issue actually has a very nice mix of new-reader-friendliness and old-reader story threads. Daredevil has been relaunched, but it most definitely has not been rebooted. If you’re going to go to the trouble of relaunching a series to attract new readers, it makes sense to try to hook those readers, no? So what Waid and Samnee give us in Daredevil #1 is an action-based issue, centering on an extended chase. Waid does a nice job relaying that Daredevil, who though blind can “see” much more with his senses, is somewhat lost in his new surroundings. He’d gotten so accustomed to the smells, sounds, and patterns of NYC that it greatly helped his super heroics. By contrast, San Francisco is a mess of new stimulus that he hasn’t been able to sort and parse yet. The basic plot of the story is that the deputy major’s daughter has been kidnapped by terrorists. Murdock uses his enhanced senses and deductive reasoning to (rather easily) figure out where the girl is and rescue her. The twists is that he’s pursued by goons on what look like Goblin gliders and Daredevil soon realizes that the girl has been implanted with an explosive device that the terrorists hope they will be able to detonate in a large crowd. It’s a pretty dark and sinister plot move, but Waid and Samnee are able to make the story still feel like a fun adventure. In some ways, this issue feels somewhat “light” since there is no shocking or world-breaking event teased. Still, it’s a very well-crafted issue in terms of story, character, art, and writing. I don’t mind Daredevil being relaunched if it means that more fans get to see what tremendous work is being done each month with Murdock and company by Waid and Samnee.